Featuring stories from Lucy A. Snyder, Jeff Salyards, William Meikle, Teresa Frohock, Zachary Jernigan, Betsy Dornbusch, and more. 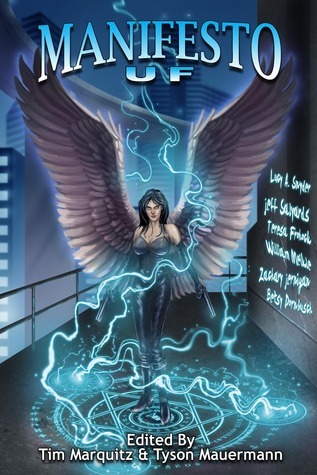 Statement of fact: the world needs more urban fantasy anthologies. There’s no doubt about this, it’s a great way to discover new authors or refresh your memory about a series you enjoy. And here’s another fact: there are very few people I’d trust more to put one together than Tim Marquitz, and with Manifesto, he proved me right. Because I’m always right. Duh. If there’s one thing most of these stories have in common, it’s that they’re raw and unconventional; not quite stories in the traditional sense, but rather episodes that start and end at equally random places. They are completely unrestrained in the violence department, and some of them have strong elements of horror. I don’t see big publishing houses allowing such freedoms in their anthologies, so I’d point this out as yet another advantage of indie publishing. Anthologies in general are so hard to review, I never quite know how to approach them, but I’ll do what I usually do, point out a few stories that were more impressive and/or memorable than the rest. In Rev by Kirk Dougal a revenant tries desperately to redeem his past sins in hopes of dying and finally staying dead this time. The rules of his existence are laid down pretty quickly, albeit somewhat awkwardly, and the entire story is bold, violent and surprising. In I’m An Animal. You’re An Animal, Too. by Zachary Jernigan a female vampire (or something akin to vampires) searches for the next person to turn into one of her own. The characterization in this story is fabulous: this three hundred-year-old creature without pity or compassion, completely unrestrained in every way, was portrayed remarkably well. The story is not for those with a weak stomach. Gore, monsters and senseless violence all seem to be part of Jernigan’s signature. By far the most impressive story in my (not so) humble opinion is Los Lagos Heat by Karina Fabian. In it, a dragon private investigator tries to solve two seemingly unconnected cases at once. I liked Vern so much that I immediately researched all DragonEye PI books and short stories and I’m determined to make time for them very soon. In Queen's Blood by Lincoln Crisler Max has the ability to cross over to a parallel world, a place he calls Erth because it’s almost, but not quite, a mirror image of our own. Crisler is clearly a very confident writer and his experience and self-assuredness radiate from every page of this far-too-short story. Manifesto is urban fantasy in its rawest, most elementary form. It is a constant source of surprises. Without the restraints of formulas, tropes and confines of the genre itself, one never quite knows what to expect. Here’s to hoping that these editors will put together something similar very, very soon. Tim Marquitz will be here later this month to tell you more about Manifesto UF so make sure to stop by. A copy of this book was kindly provided by the editor for review purposes. No considerations, monetary or otherwise, have influenced the opinions expressed in this review. I am not a fan of urdan fantasy of the late and haven't read much from it but this one sounds like a great anothology novel for me to try. Huh, I'm usually not one for anthologies, but this one sounds excellent, particularly with UF as the genre of choice. I'm not familiar with any of these authors, but I trust your judgement and will be off to check this one out soon! Great review, Maja! You know I love me some UF! I might have to check this out, though anthologies are hit or miss with me. I haven't heard about this one before, but since I love Urban Fantasy, will surely have to give it a try soon! I couldn't agree with you more on anthologies, I love them for those very reasons. I am so glad you enjoyed this one! Have a great weekend Maja! Wow, this anthology seems intense, Maja! I don't know if my stomach can digest all that gore and ultra violence. I'm curious about the dragon PI though. I'll have to look out for your review on that series. Happy Friday! "not quite stories in the traditional sense, but rather episodes that start and end at equally random places. They are completely unrestrained in the violence department, and some of them have strong elements of horror." I really want to read more UF, so I think this would be a wonderful place to find some new authors. That's great you really loved it! I'm so glad you enjoyed MANIFESTO: UF, and of course, I'm thrilled you liked "Los Lagos Heat." Vern applauds your good taste. I have many stories, plus a novella and two novels, starring him and his partner, Sister Grace. Folks can find the full listing plus Vern's (now defunct) blog at http://dragoneyepi.net. The stories range from slapstick to gritty--he's versatile that way. Several of the stories are free on online magazines, as well, so just follow the links. Vern's next adventure will be in serial in Midnight Diner, starting January, which Lincoln Crisler co-edits, BTW. I'm honored to be in this anthology with so many fantastic authors. Like Rummanah and Jenny, I'm not into a lot of dark, ultra-gore and violence, but that's the joy of anthologies--variety--and the writing is well-done. I so agree with you. UF anthologies are the ones I usually enjoy the most. I can usually get a taste if someone is going to totally agree with me and want to read more. Oh i'm really going to have to check out this book. Ohhh this is quite the compilation, Maja. If I were a fan of this genre, I'd jump on it stat. But maybe this is just what I need to get on the UF Revolution: short stories that are not lacking content. Great review, Maja. And thanks for the heads up! I have a lot of UF anthologies around here that I still need to read. I'm horrible at reading them, but I'm not sure why. Especially since lately I've been so short on patience with books. This might be too much for me. I tend to do okay with gore, though I don't exactly *like* it, I can deal with it. Sometimes. But I do scare somewhat easily so that might be a concern. The Dragoneye PI books might be something I'd like though! An anthology! Sounds interesting. I like that it's "unrestrained" despite the fact that I flinch at the mention of violence; I THINK I've gotten a little more immune. Great review, Maja! I have this one too. I need to get to it. :) Thank you!